The tournament starts on January 5. 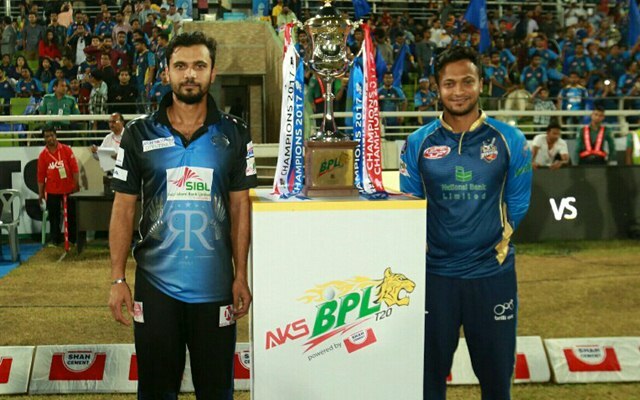 After the General Elections, which took place on Sunday, December 30, made the headlines in the country, the 2019 version of the Bangladesh Premier League (BPL) is scheduled to get underway on Saturday, January 5, and will continue until Friday, February 8. The drafts for the upcoming edition took place on October 28 (Sunday) at Radisson Blu Dhaka Water Garden from 12 pm onwards. A total of 186 local and 368 foreign players went under the hammer. Previously, the teams had retained a few of their players. The T20 tournament saw the daylight after which match-fixing scandals marred the extravaganza. Next time around, Dhaka, Sylhet and Chittagong will host the 46 matches. Rangpur Riders are the defending champions as they won the previous edition, beating Dhaka Dynamites. The Riders, owned by Basundhara Group, had an impressive campaign last time. They finished fourth on the points table after winning six out of 12 matches. After qualifying for the playoffs, there was no stopping them and they won three matches in a row to win the title. This year, they would be led by Bangladesh ODI captain Mashrafe Mortaza and they would be coached by Tom Moody. The Dynamites, owned by Beximco Group, finished on the second spot after the league stage with seven wins from 12 matches. After beating Comilla Victorians in the Qualifier 1, they couldn’t hold on to their form against Rangpur in the final in Dhaka. Next year, the three-time champions would be led by the enigmatic Shakib Al Hasan under the tutelage of Khaled Mahmud. The Victorians did exceptionally in the league stage with nine wins from 12 matches. However, they slumped to consecutive defeats in the playoffs against Dhaka and Rangpur respectively. In the next edition, the team owned by Legends Sporting Limited, would be captained by dashing left-handed batsman Tamim Iqbal under head coach Mohammad Salahuddin. The Vikings, owned by DBL Group, finished as the cellar dwellers last season as they could only win three out their 12 matches in the league phase. In the next edition, they would be captained by wicketkeeper-batsman Mushfiqur Rahim under the tutelage of Nurul Abedin. The squad also has Mohammad Ashraful, who would be making a comeback to the tournament after quite a few years. The Titans are a franchise, owned by Gemcon Group and they finished third in the points table in the 2017 edition of the tournament. They won seven out of 12 matches and then bowed out after their loss in the Eliminator against Rangpur. They would be captained by Mahmudullah Riyad and would be coached by former Sri Lankan captain Mahela Jayawardena. The Kings, owned by Mango Entertainment, finished second last in the points table in 2017 and they would be looking to make amends. They could only win four out of their 12 matches. They would be led by left-handed batsman Mehidy Hasan under former South Africa all-rounder Lance Klusener. Rajshahi are yet to win the mega tournament. The Sixers are a franchise owned by Sylhet Sports and they had a disappointing season last time as they could only win four out of the 12 matches. They are also one of the teams, which are yet to get their hands on the coveted trophy. They would be captained by David Warner in the next season and would have former Pakistani fast bowler Waqar Younis as the coach. 06. 01. 2019 Khulna Titans vs Rangpur Riders. 09. 01. 2019 Sylhet Sixers vs Chittagong Vikings. 09. 01. 2019 Khulna Titans vs Rajshahi Kings. 23. 01. 2019 Khulna Titans vs Sylhet Sixers. 25. 01. 2019 Chittagong Vikings vs Rangpur Riders. 29. 01. 2019 Chittagong Vikings vs Comilla Victorians.